After the failed attack to capture Guillemont on the 18th August 1916, efforts continued to consolidate and increase the British and allies gains around the village. One of the other strategic objectives was an area known as Delville Wood and High Wood. The 2nd Leinsters were entrenched due west of a small village called Longueval during late August 1916 when 'B' company of the 2nd Leinsters were ordered to retake part of the line recently taken by the enemy at Delville Wood . Under continuous bombardment from the enemy the task was nigh on impossible and with most of 'B' company being lost and reduced to just thirty-five men, 'A' company 2nd Leinsters were moved in to reinforce the much depleted 'B' company. After a gruelling period in which further attacks were repulsed, the 2nd Leinsters finally took back the section in the first few hours of the 1st September 1916. The losses of the 2nd Leinsters had been severe. By the 4th September 1916 the 2nd Battalion could muster only 9 officers and 270 other ranks. Amongst the casualties were the following. Officers 7 K.I.A and 17 wounded. Such was the depletion of the battalion that the 2nd Leinsters were moved away from the front to replenish and in doing so did not form part of the final push for Guillemont. 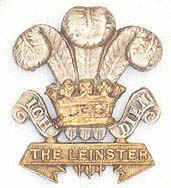 However the mantle of honour for The Leinsters was to be taken up by the 7th Battalion who were part of the 16th (Irish) Division.